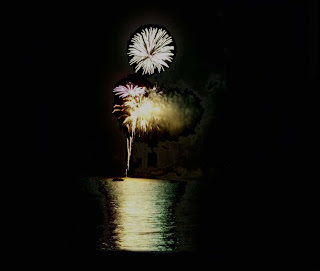 In the true spirit of Independence and the preemptive strike, South Whidbey’s patriots ignore the calendar and shoots off their fireworks on July 3rd. They do it right outside my back door. Here’s a picture I took of the festivities a couple of years ago. And here’s a shot of the preparations for this year’s bash. 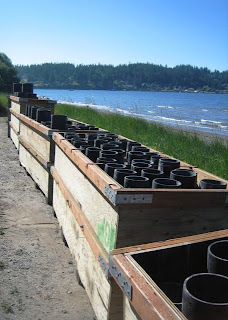 Ten of these crates full of sand and giant shell casings were arrayed along the shore yesterday. Today they’re being loaded aboard a landing craft that will be moored out in the harbor tonight as the platform for the show. This afternoon crowds will descend on the partk across the harbor to hear patriotic songs and get sticky with cotton candy and sugared drinks. Up and down the shore families are hosting barbecues and swanky parties. At our house the doors are open to whomever wants to come by, and after sundown a motley assortment of friends will show up with their BYOBs and drape themselves over our beach deck. Let the oohs and aahs begin! Tomorrow, and the rest of the weekend, and the week after, cardboard and plastic junk will wash up on the beach. I’ll pick up as much as I can. It’s the hidden junk that really concerns me. The chemical fallout from all these shells drifts down to the waters of harbor, dosing all the creatures below the surface with sulphur, manganese, copper and oher heavy metals. The prevailing winds are from the north and the shallowest portion of the harbor, including mudflats, is to the south, a situation which insures that the heaviest concentration of the toxins will end up right in the clam digging beds of the public park. This is killjoy stuff. What kid hasn’t looked up at the sparkling night sky and dreamed of being that romantic character, the pyrotechnician? I know I’ve thought about it myself, even as an adult, after meeting a woman who was learning the craft. And I’ve seen some absolutely stunning shows. One on Lake Union in Seattle was choreographed to music, like Bellagio’s fountains. Happy Independence Day. Keep those fingers intact and a hose within reach, it’s really dry out there. Next Post:Add lime – works for gin and tonic, but global warming?